The sweltering heat of summer has taken over the temperature gauge and it’s time to turn up the heat of the grill and create cool, and easy to make frozen treats. Getting to the store and getting back is all about one-stop shopping and gathering all the ingredients you need in one felt swoop. I’d rather be out in the heat, soaking up the rays, poolside, than in the stores shopping, because the Vitamin D is just waiting for me and the shining sun makes me happy. I want to share with you my most coveted, easy to recreate MOM recipe that makes you the star of the summer. 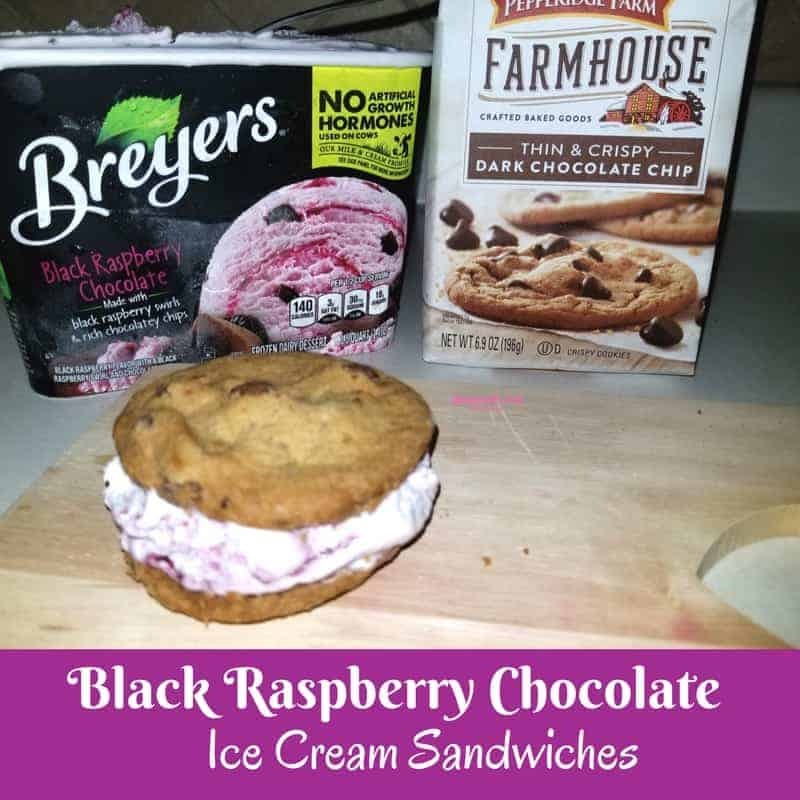 Stock up your freezer and your pantry with the ingredients to create my Chocolate Chip Cookie and Black Raspberry Chocolate Ice Cream Sandwiches recipe and then take five and heat outdoors to enjoy the lovely season of summer! Lavishly live homemade ice cream sandwiches out loud and scoop up the fun! Hot summer days require really ‘cool’ drinks ice cream. My recipe for the Black Raspberry Chocolate Ice Cream Sandwiches requires a stop in the Ice Cream aisle! You can choose whatever flavor you like, for this, I paired black raspberry chocolate with chocolate chip cookies, totally, ‘da bomb’! Sometimes I find it so hard to choose yet other times I just pick a flavor and walk away! Whatever works right? I love this recipe because it is sinfully easy to create. As a result, my family gets this dessert a lot during the summer months. It is important to realize that you can make multiple combinations with different flavors of ice cream. I find that this is a point often overlooked but truly deserves recognition. Simply use my recipe as a springboard to create your own delectable combinations. Make these delectable cold treats in seconds and please your whole crowd. Place 2 cookies in your work area. Next, Spoon A large Gob of Ice Cream onto one cookie. Similarly, top the ice cream gob with the other cookie and Repeat until you have used the whole bag. By all means, serve Cold or Wrap and store in the freezer until you are ready to serve. The Black Raspberry Chocolate Ice Cream Sandwiches are easy to make, and serve up smiles in those hot summer days! With multiple flavors to choose from and so many different cookies, your creations options are endless. What is your favorite flavor of ice cream? Use that flavor to create your first sandwich. On the positive side, these sandwiches are so easy to make that there is hardly any cleanup and there are a lot of smiling faces afterward. Keep your time in the kitchen cool and stocked up with frozen treats, Have a great summer and enjoy the outdoors and all of those parties, lavishly living summer out loud. Now that is a decadent treat if I ever saw one. 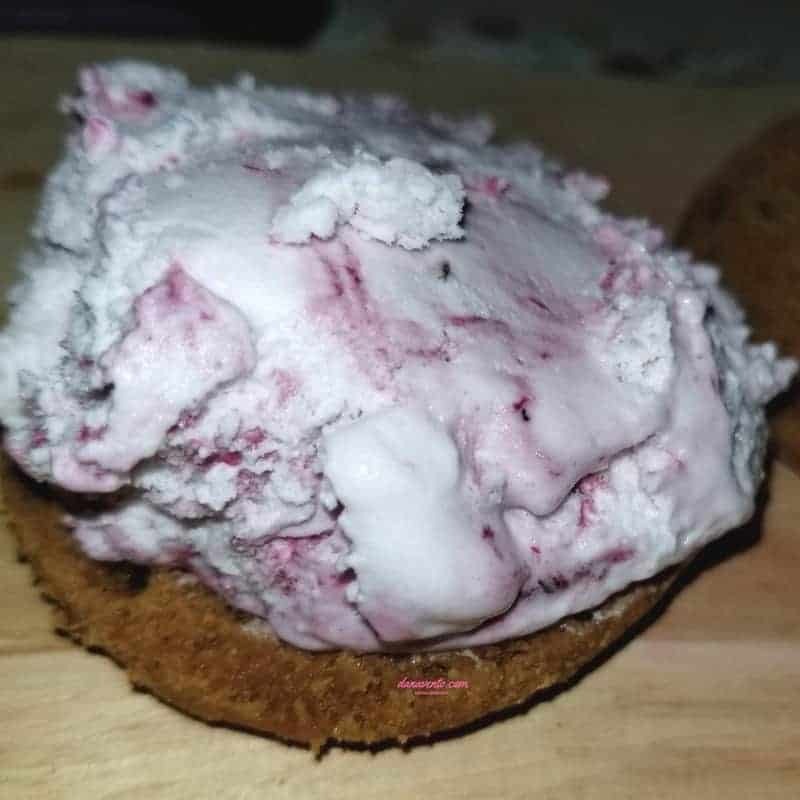 Yummy raspberry ice cream on a cookie. You made me crave for an ice cream sandwich at this hour. OMG. those look so delicious! I will have to get Breyer’s ice cream and Farmhouse’s dark chocolate cookies. We’ll have ice cream sandwiches for dessert tomorrow. Yummy! My two favourite words combined together! Ice cream and sandwiches! Sounds like a winner to me. OH wow these look amazing!!! I love black raspberry and chocolate but combined sounds delicious! I’d love to try them! you are so right, any sweet treat that involves ice cold sensations screams at me in this heat! Even when trying to eat healthy, the temptation for ice cream is always there when the sun is shining! I love ice cream during the hot summer months. This ice cream treat looks delicious and easy to do. I will have to try doing this soon! Oh my goodness, these look like heaven. I’m definitely going to have to save this recipe. My husband would love it! This recipe is SO simple and yet looks SO good!! Definitely going to try this, as well as some attempts w my own spin on it, in the near future! These looks delicious, raspberry ice cream is sooo good. I may have to find an alternative to make these in the UK, but I will find them!